Goodworks Network is pleased to sponsor Project Teddy Bear to provide an extra source of love, comfort and security to those in need. This effort is in cooperation with community members where the teddy bears are sent to. 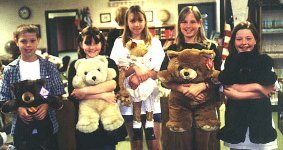 A shipping location and the needed help is arranged for on the receiving end where these bears are distributed to the children for whom they are intended. Everyone is welcome to participate in Project Teddy Bear, no matter how the notice is distributed. News media is encouraged to spread the word as they see fit. We ask that everyone directs people to www.Goodworks.net for these written instructions. Only the Members of The Goodworks Network (those who have subscribed to the monthly e-mail Newsletter) are notified by Goodworks.net, enabling them to stay informed of the events and their progress. Participation in Project Teddy Bear, and in other Goodworks Network projects is totally voluntary and without obligation. Our thousands of members have elected to stay informed for the purpose of serving others and we have found that most people are inherently good folks with a big heart. We invite you to become a Member of the Goodworks Network too by subscribing your email address at our Membership & Newsletter page. This will enable you to get the news first hand from Goodworks.Net and read of the many inspiring good works our members are involved with. To participate in Project Teddy Bear, all you need to do is purchase or donate at least one teddy bear (more if you can send more) and send it via UPS or USPS to the address given, during our "Teddy Bear Season." In other words, during the time frame given for each campaign. 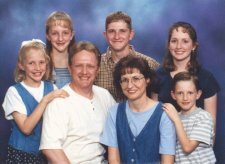 The manager of the Littleton, Colorado Campaign was Loalyn Hellewell and her family. We extend our gratitude for Loalyn and her team of helpers who made this project happen. 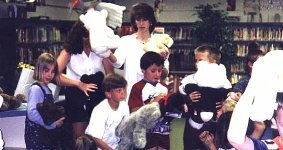 Hundreds of hugable teddy bears went to the friends, family members and community members of the victims of the Columbine High School Shooting. 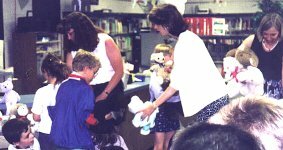 Younger siblings of some of the shooting victims of Columbine High School were given first choice of the hundreds of teddy bears sent by Members of The Goodworks Network. Our message "Love is stronger than hate" was spoken and felt by all who gave, received, or helped with this project. Several large groups of children, like this one, sat and listened to the story of where these teddy bears came from, just before they were given the teddy bears, sent from Members of The Goodworks Network. Teddy bear distribution was very orderly and each teddy bear recipient felt the love which their furry friend represented. Most of the children gave a welcoming hug to their teddy bear, knowing that the bears had been hugged by the Members of the Goodworks Network who sent them. 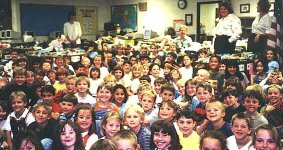 Tears filled the eyes of the teachers and school staff, during the teddy bear distribution, as they bid farewell to the hundreds of students on their last day of school, before summer break in 1999. Remember to subscribe to the Goodworks Newsletter to become a Goodworks Member and stay informed of the opportunity to give your love and service. God bless you!